Discover what's new in Demo Builder. Video Detailer - now available! 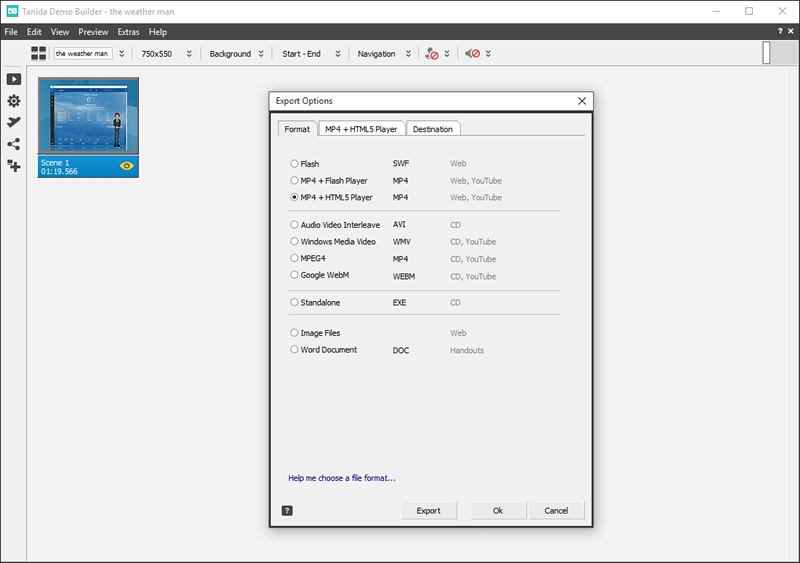 Video Detailer is a full-featured, intuitive and powerful video creation application. It has an elegant design that reduces interface clutter while leaving all the tools you need a click away. With the ability to record and incorporate anything you need to create videos, it is all you need to make outstanding, high-quality videos for any purpose. Take your video creations to a new level with the ease of point-and-click simplicity. Did you know we will be launching a new product? We’re excited to announce that we're working on a new product, VideoDetailer. If you’ve purchased Demo Builder within the last 12 months, you should be even more excited as you will receive VideoDetailer for free! This is in line with our policy of 1-year of free upgrades and support. If you’ve been waiting for the updated version of Demo Builder, we thank you for your recent purchase of Demo Builder and are providing you VideoDetailer for free as our way of showing our appreciation for your support. What will happen to Demo Builder? We will continue to work on it. The Character and interactivity features will be improved and much more... stay tuned for more details. Although this past year we didn't make any major updates, it doesn't mean we didn't work to enhance Demo Builder. We made 26 minor updates, solving bugs triggered by Windows 10 Anniversary update and also added minor improvements. What's next? Our developers are rewriting the application to make available a 64-bit version, screen recording with 30 fps in 4k display, dpi-aware user interface, much faster export including hardware acceleration... and more surprises for our customers. We are hoping to have the first version of the improved application ready in the early part of 2019. Stay tuned! If you purchase(or upgrade) our product today, you will receive 1-year of free upgrades and support. That means you'll get our upcoming, new version for free! Now that's a bargain! Be notified when the new release is available OR subscribe if you are interested in beta testing. Good news! Couldn't find the right character for your movie before? Now you can add our entirely new animated character, Joey, to your next movie. Edit his actions and dialogue with our full range of realistic movements. 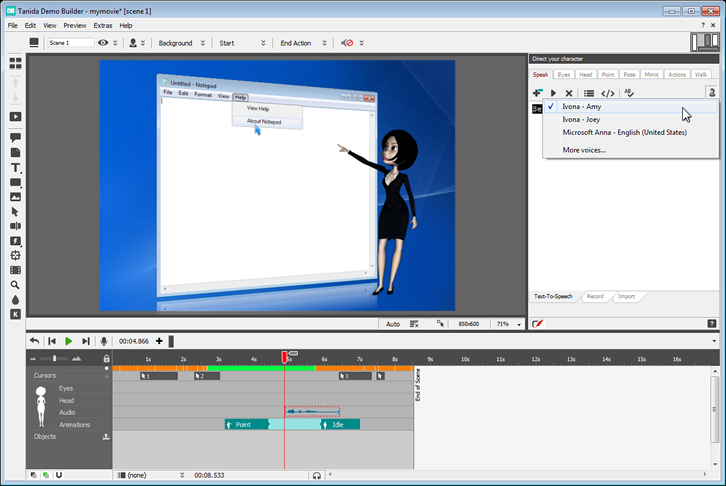 Record your own voice or use the built-in Microsoft voices installed on your computer to create the next generation of tutorials, presentations or demonstrations using the help of our realistic animated characters. Our male character, Joey, is now ready for use in your next movie. Switch between our animated characters, Amy and Joey, with a single click. Use our virtual presenters in your movies in order to captivate the audience's attention! Version 11 has been fully tested with Windows 10. 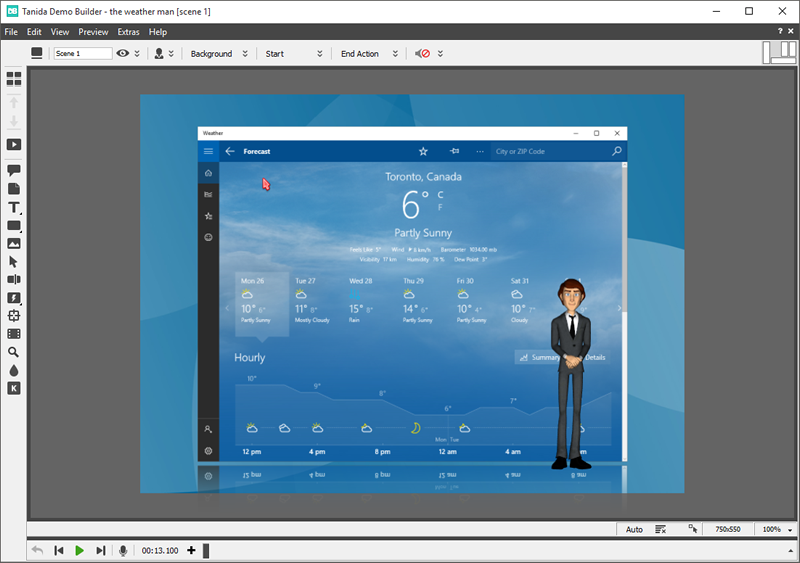 We've also updated the user interface in order to fit the new look and feel of Windows 10. We're sure you'll like the fresh new look. 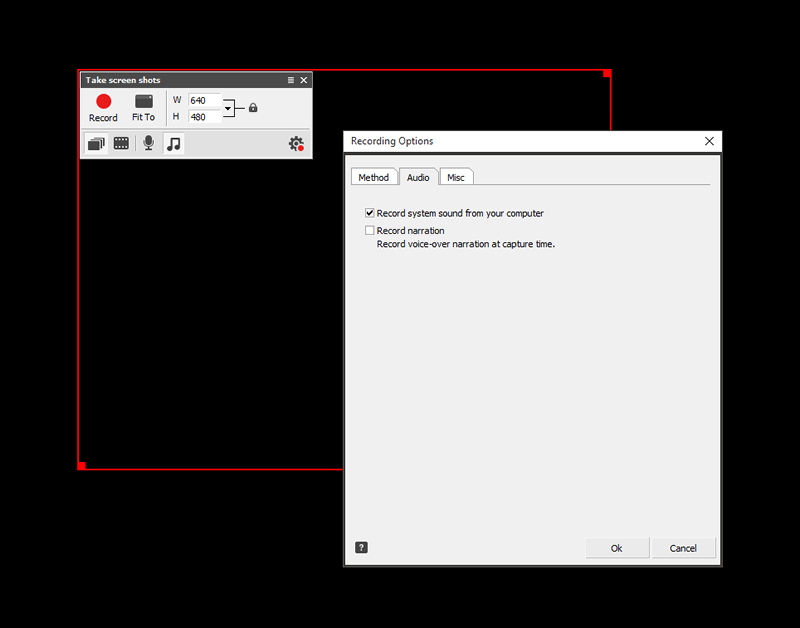 Now you can record the sounds being played on your computer as you record your application. Any sound, any time. Make your next movie sound unique, customized and most of all, catered to your audience. Now you can add animated characters to your movie and edit them with a full range of amazing actions and realistic movements. From walking, talking, greeting and explanations to intricate eye and head movement; with these new options you'll be creating professional demos in no time ! 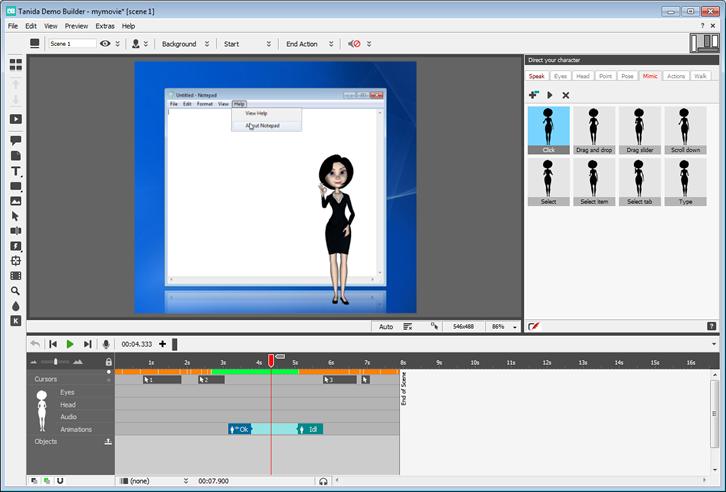 Characters add a new dynamic by offering a more lively personality to present your movies; they are great for creating eye-catching videos and are perfect for explanations in tutorials. 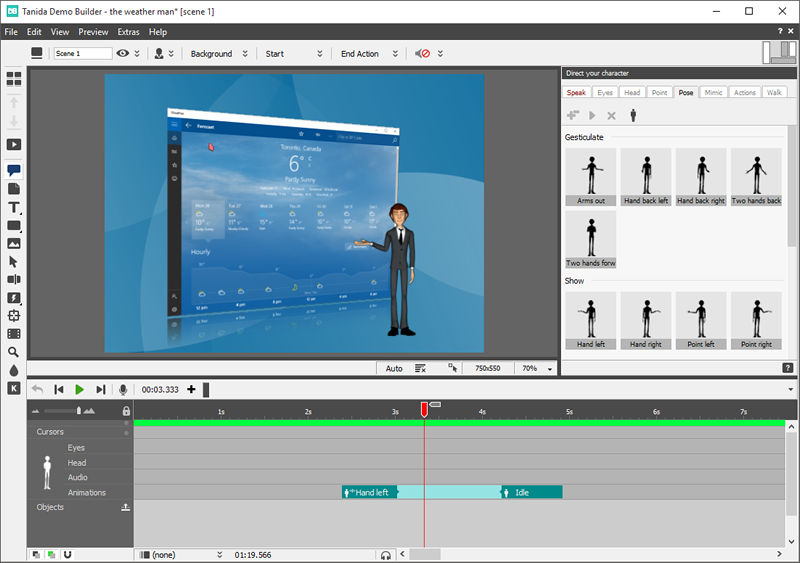 They are also extremely simple to animate and integrate into your movie, so don't hesitate to make full use of this new feature. We're confident that you'll have fun with this new feature, because directing your Character to walk and talk is such a smooth and simple process. The ease of animation will allow you to get creative and really make your Character come to life with detailed facial movements, life-like gestures and so much more. This option is for when you have a time limit and you need your demos done now! 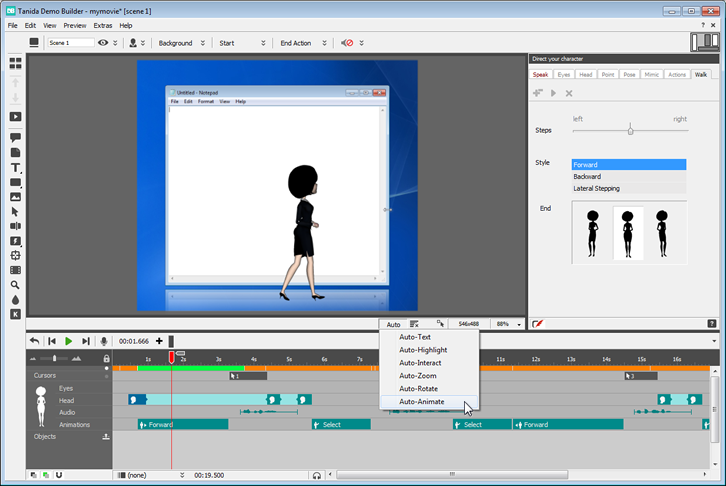 Click Auto-Animate and Demo Builder's sophisticated programming will read the actions performed in your screen recordings and create movement and speech for your Character accordingly, it's so simple ! Ivona brings you award-winning, accurate and natural sounding voices. These smooth and lively voices take the robotic out of your computer's default voice ! Use them to convert Text to Speech and have your movies sounding clear, vibrant and, most of all, professional.